If you like fast-paced tasks, a diverse work environment, being out and about while getting paid, and food (but not making the food) then starting a restaurant food delivery service. This green business idea can be as eco-friendly as you want to make it, whether you’re doing bicycle deliveries or using an electric vehicle, or specializing in local independent restaurants or those that serve organic, vegan, or vegetarian options. With access to a restaurant food delivery service nearby (and one that has ethics and ideals that people want to support), eating out can be as simple as eating in, which is a win/win situation for the restaurant, the delivery service, and the customer. 1. What is a restaurant food delivery service? Many restaurants want to offer delivery of their food, in order to increase their potential sales and reach different demographic. However, the process of hiring a delivery person, paying to insure a vehicle, advertising their food delivery service, and operating an extra business segment can present significant management and financial challenges to small restaurants. Your food delivery service business would represent several restaurants who don’t want to do all those tasks on their own. You don’t need to prepare any food or have to deal with the business end of food service, because you simply provide a service to these restaurants. You can do the food deliveries on scooters, bicycles, or in a hybrid vehicle to make the transportation as eco-friendly as possible, and can also emphasize the availability vegetarian, organic, and other eco-friendly options in your advertisements in order to do your part for the earth. There are no formal educational or training requirements for this job. However, the work requires that the worker be well-organized, someone who really hustles (every minute counts in delivery), and be able to lift up to 25 pounds. A good working knowledge of the local area is a big plus, as you’ll need to set clear guidelines for your delivery area and know how much time it takes to get to each location. $-$$$ (on a scale of $ to $$$$$). This largely depends on the delivery method most suitable to your individual situation. It might be helpful to establish your credibility and visibility to potential customers by investing in some kind of “uniform” (could be as simple as a branded t-shirt or hat), as well basic signage for your vehicle. A mobile phone is a must, and to avoid mixing up business and pleasure, you may want to buy a completely separate phone and mobile plan just for your food delivery service. $$-$$$ (on a scale of $ to $$$$$) The income potential for a food delivery service is variable, and depends on the method you use to charge for your services (flat rate per trip, sliding scale based on total order amount, etc. ), how much you charge, and the number of customers you have each day. 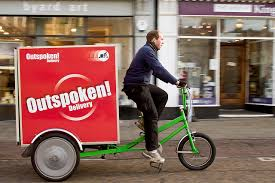 A one-person operation that delivers on a bicycle may not be able to handle as many customers as someone driving a delivery vehicle, but paying an additional person to help you with deliveries may offset any additional profits from the business that may come from having an increased number of customers. 5. What is the best location for a restaurant delivery service? Location you start the business in is not very important, but focusing your energies on urban and semi-urban settings will be the most efficient for deliveries (shortest distances, more unique restaurants). Areas with a high concentration of restaurants that are close to areas with large numbers of customers are the best type of area to operate in. Are you a high energy person? Do you live in a place with a lot of unique, locally-owned restaurants? Do you function well in a fast-paced environment, and juggle multi-tasking well? Are you comfortable making deliveries at night, or in bad weather, to locations you may not know?